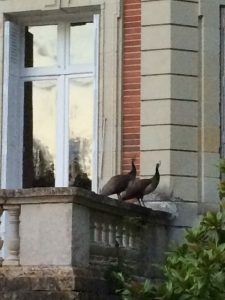 Last night, my lovely wife and I returned from a promenade on the chateau grounds at sunset and saw, to our mutual surprise and delight, two peacocks perched upon the back terrasse balustrade. We instantly sensed it was a good omen. In India, if a person sees a peacock while traveling on a journey, it is considered a sign of good luck. To see not one, but two peacocks, we interpreted to mean double the good fortune. Hopefully, it bodes well for the book journey we have just embarked upon. So, the first week of my book’s release has passed. It was exciting to see the book finally released and, as my wife noted, to realize that the book is actually now being delivered into people’s homes across the country–and world (there was even a purchase made in Ireland). I’ve already heard from a few readers who have received the book and started reading. Several have commented on the beautiful cover, one on the book’s heft, another reader called it “addictive,” and a fellow lawyer referred to it as a “fun read,” after completing the first couple chapters. 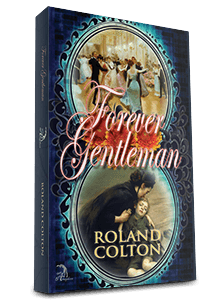 Book Release — Forever Gentleman is Here! During the first week, I conducted a couple of blog interviews and had some other articles about the book posted online. It’s been exciting to see it all begin to come together, after waiting so many months. 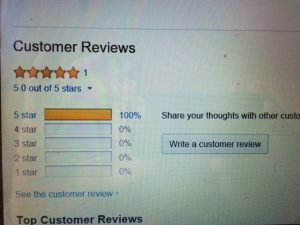 I hope those of you who enjoy the book will take the time to post a review on Amazon; it’s easy enough to do… just click onto the box that states: “Write a customer review” and begin writing. Amazingly enough, the first “customer” review came from someone with the same last name as myself—what are the odds?! And, even more astonishingly, the reviewer had the same first name as my younger brother, Gregg. What an amazing coincidence! Well, it may have actually come from him, I suppose, since I’m aware he got his hands on a copy of one the Advance Review editions a month or two before the release date (which is not the way you’re supposed to get one!). 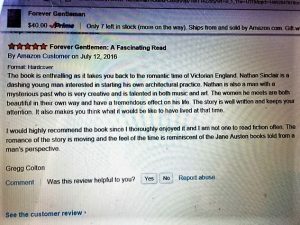 Little matter, he gave the book a very nice review. So, if you enjoy the book, a nice review would be greatly appreciated. If you don’t like the book—of course, I can’t imagine anyone falling into that category—then you needn’t bother. We are looking for Five-Star reviews here! Right now, with my brother’s review, we have an unblemished Five-Star Rating and it would truly be a shame if someone tarnished that. Moving on, in less than three weeks’ time, we’ll be home in California and then the fun starts. My publicist is in the process of scheduling some book signings, interviews, speaking engagements and maybe even combined with a concert or two—which gives me cause for concern. Some of you may have read one of my previous posts on “Learning Chopin’s Quatrieme Ballade.” Well, I have been working on it and have almost half of it now memorized, but I am running out of time. We have a neighbor in France named Nathan (astonishingly the same first name as my book’s protagonist); his primary residence is in Australia, but he has a summer home next door. He used to be a professional cello player, so I tried the second-half of the ballade on him. He seemed impressed, although since he had just enjoyed my wife’s fine dinner cuisine, he may have felt compelled to offer a compliment. His concern is that a twelve-minute piece may be a bit long for some people’s attention span at a book reading/mini-concert. So, dear readers, let me know if you can stay awake that long or not. If the consensus is “z-z-z-z-z,” then I may condense it to half that time (I can just imagine the Chopin lovers grinding their teeth). The real problem, however, is I need more than three weeks to get the piece to something close to a playable level. So, if there is a mini-concert in August or even September, I doubt the ballade will be on the agenda. Maybe later, under optimum circumstances. In the meantime, I anxiously await your Five-Star reviews!! !